Do you need free pallets? If so, you have plenty of company. Pallets are becoming increasingly popular for arts and crafts as well as other projects. Here are some spots to start your search. As I outlined in Free and Low-Cost Pallet Sources, it is usually hard to secure pallets from a large pallet generator such as a supermarket, big-box retailer or manufacturing plant. Large businesses usually have pallet programs in place to reuse pallets internally, return them or recycle them. Also, many will not let unannounced outsiders on site. With this in mind, you are better served to deal with small shops, schools, seniors residences or other operations. This is a variant of the "Think Small" theme above, but it has also worked for me at supermarkets and large building supply retailers. Over the years, I’ve chatted up more than my share of local retailers. Yes, part of the friendliness was self-serving. If you are looking for a specific type of pallet, and you are a valued customer, good things can happen. Many shop operators have pallets they will happily give away if it is not too much of a hassle to segregate them for you. Even if your local business contact can’t get you the pallets you need, perhaps they can arrange a referral further up the supply chain to their distribution center. Often, distribution centers may receive very good quality, but non-conforming pallets that are not compatible with their systems. As such, they may be willing to set them aside and make them available to you for pickup. But never show up at the distribution center unannounced. Make sure to get a referral first. Realistically, having a distribution center let you in to take oddball pallets can be a longshot, but it might be worth the effort. If you can establish a relationship with the facility, you might lock into a large and enduring supply. One thing in your favor is that as business increasingly seek to achieve Zero Landfill and other sustainability aspirations, pallet upcycling is a clear step up from landfilling or grinding. 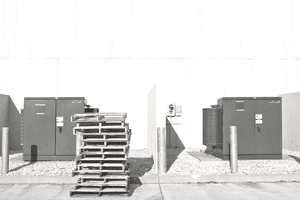 If you happen to notice empty pallets leaning against the back of a facility or at a construction site, site management or operators might be amenable to letting you have them, but be sure to ask. Do not assume that empty pallets are there for the taking. While it seems a reasonable assumption that pallets left outside and unprotected are not wanted, you might be wrong. Sometimes businesses store pallets outside because they don’t have room inside to keep them until they are picked up. Be warned that some states have pallet and container theft laws that might be applicable. If the pallet has an ownership stamp on it, such as CHEP, PECO, iGPS, Coca-Cola, U.S. Postal Service or others, then it should not be removed. Such companies vigorously enforce the property rights to their pallets, and you may find yourself charged with unlawful possession of them. Pallet recyclers often receive very good quality but non-standard pallets that have little or no value to them, except possibly for dismantling or grinding. If you visit a recycler and explain the type of pallets you need, they may have non-conforming pallets available for free or for a reasonable charge. Although the name of the game is to obtain free pallets, the reality is that buying a new wood pallet is not all that expensive. In addition, they typically look great, constructed from fresh new lumber. By the time you consider the cost of your search for old pallets, it might just turn out to be a more cost-effective solution to purchase pallets from a local pallet manufacturer. There may be pallets that are off-sized or with other defects that make them inexpensive and a great buy for crafting.